The Legend pips David James to the goalkeeping spot as he has won the Player of the Season award on three separate occasions, as opposed to Jamo’s two (2007, 2008). Knight’s first was in 1982 followed by back to back wins in 1995 and 1996. John Milkins (1969) and Peter Mellor (1979) also picked up the award, assumingly without spilling it. With the purse strings tightened and the FA Cup winning team dismantled, the start of the club’s decline can be traced back to the 2008/09 season. The champagne football of previous campaigns turned into flat Tizer. Johnson was the exception and kept his playing standards high – including that 30-yard screamer against Hull. 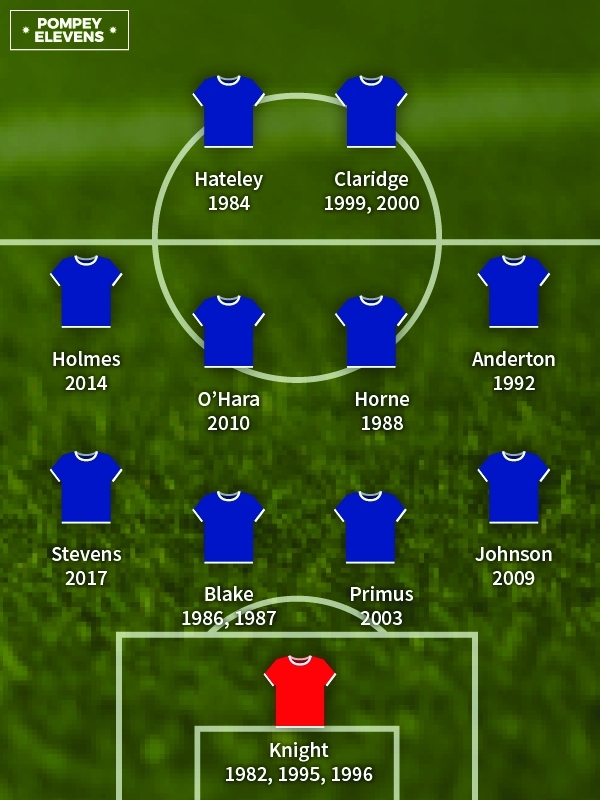 The 2002/03 season saw Pompey win the Championship and return to the top flight after a 15 year sabbatical. There were fantastic performances all over the pitch. Matt Taylor was a marauding left-back, Paul Merson masterfully orchestrated the midfield and Svetoslav Todorov was the division’s top scorer. Who won the Player of the Season award? Yep, you guessed it. Following his £110,000 capture from Birmingham, Blake settled in slowly at Fratton Park and was on the verge of leaving. However, with his and Billy Gilbert’s defensive partnership gelling he stayed on to win back to back Player of the Season awards and lead the club back to the top flight. The Irishman was the model of consistency throughout Pompey's Div Two championship winning season. He rarely gave the ball away, defended manfully and chipped in with a healthy number of assists. His move to the Championship with Sheffield United was well deserved (as well as hugely upsetting), and he has also been a recent addition to the full Republic of Ireland squad. His goal against Liverpool in the 1992 FA Cup Semi at Highbury may have brought him into the national spotlight, but it was already clear to the Fratton faithful that Anderton was destined for great things. He picked up the Player of the Season award just before being sold to Tottenham for a club record fee. He was Spurs' Player of the Season the following term. Pompey’s return to the top-flight during the 1987/88 season didn’t quite go to plan and an immediate return to Div 2 ensued. On a personal note, Horne had an impressive campaign in the centre of midfield and iced the cake with a goal against the mob down the road. For his efforts he not only won the Player of the Year award, but he was also sold to that lot for £700,000. The combative Welshman was caught in the middle of a perfect transfer storm and received death threats from both sets of supporters. The tidy midfielder spent a season long loan from Spurs at Pompey during the 2009-10 and impressed all with his contribution. So much so that it was his name engraved on the Player of the Year award. He’s now turning out for Billericay Town after making a complete arse of himself on reality TV. It always seemed appropriate that Holmes was signed by us from Barnet, as here is a player with more dodgy haircuts than step-overs in his locker. Pompey hardly covered themselves in glory during the 2014 season but what little football there was played usually involved the mini man-bun in one way or another. Boot camp veteran Claridge used all the nous accumulated on his journeyman travels to help himself to a couple of Player of the Year awards. The talismanic scruff did all he could to keep an uninspiring Pompey team from the drop. He briefly earned the role of player-manager off the back off it, but it wasn’t to be. Attila may have been a one-season wonder but what a season it was. An impressive 22 league goals from 38 appearances including back-to-back hat-tricks meant he was an absolute shoo-in for the Player of the Season award in 1983/84. It’s just a shame that the award wasn’t enough to keep him from swapping Fratton Park for the San Siro. Funny that.